My dear friend Julia Ho, invited me to a screening last month held at Laemmle’s Santa Monica Theater. I have been to a few screenings using the platform Gathr Films, but didn’t know that it is the new alternative to Theatrical Distribution via Community Cinema gatherings until Julia invited me to have a C2E Screening through this platform. 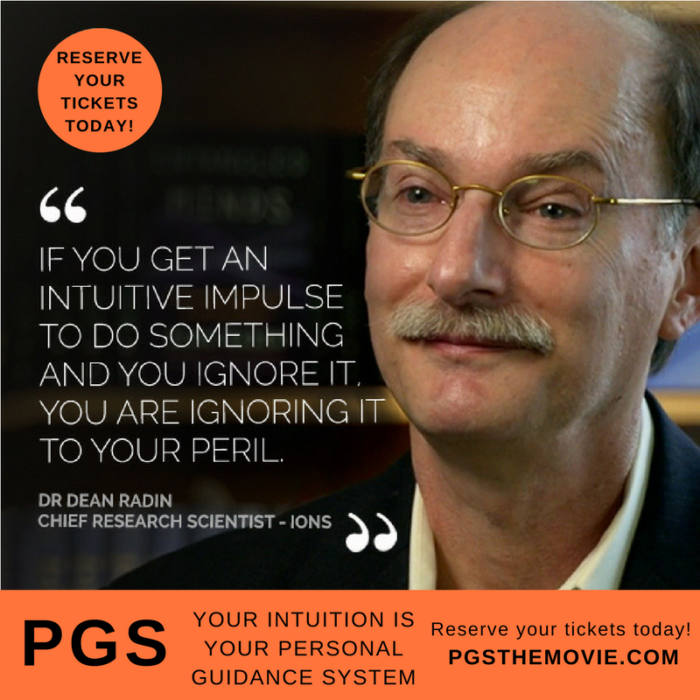 The movie “PGS – Intuition is Your Personal Guidance System” follows Australian Filmmaker Bill Bennett’s journey to find out what was the voice that saved his life. 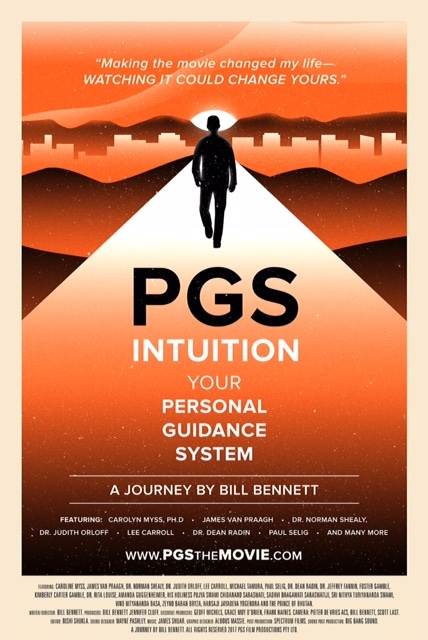 Bill shows us how to use our intuition through a global exploration of high level professionals in the field who have dedicated their lives to the Personal Guiding System inquiry. Bennet plays with the GPS metaphor as a way of making a way too familiar dependence to other guiding systems in our world today. Our training in getting answers for our lives has been, for the most part, OUTSOURCED dependent. In other words, from Mom & Dad to Teachers, from Pastors/Priests to Doctors, from Published Authors to Public Figures, from Friends to even Strangers, most of our mainstream ‘seek for help’ direction has always brought us outside of our own inner wisdom. I personally was always described as being impulsive as a child, adolescent and many adult years. And I was!! Once I learned to manage my impulsive nature, I became kind of scared at following my own intuition. I thought to myself, “No, don’t go there, you know that gets you in trouble,” this belief had me always asking other people for their counsel and advice, like everybody else. I was cured from this co-dependent state of being 4 years after my husband died in 2012. After years of asking Pastors for advice, a series of events revealed the dangers of this practice, specially when I experienced myself having panic attacks about how God was mad at me for not continuing to follow the church. I realized my metal breakdowns where based on FEAR of not trusting my inner guidance. Years of seeking for the answer outside of myself created a pattern of fear when faced with having to make my own decisions. Part of my journey as a Single Mother, Creative Entrepreneur, and Home Owner has been the tough lesson of trusting my inner guidance once again. 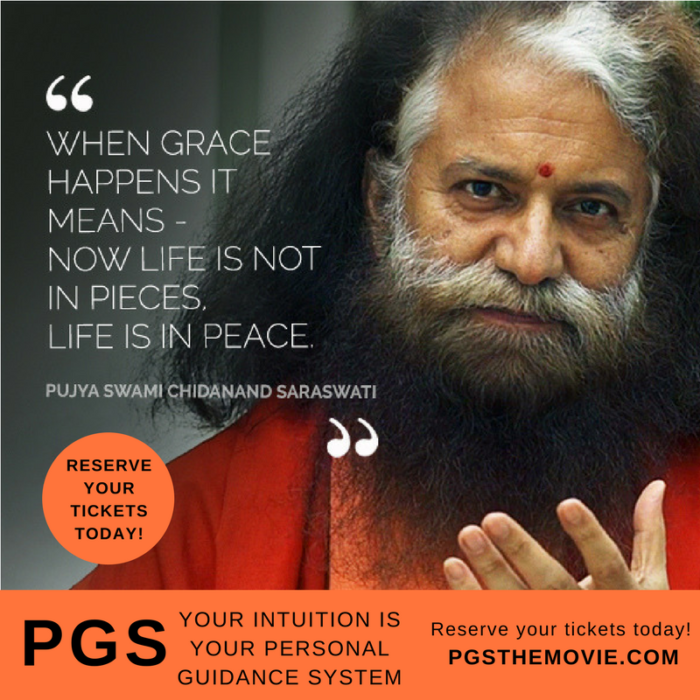 This time, learning the difference between being impulsive, which listens to our ego nature (caring what others think, wanting to look good, concerned with doing what others expect of us); and being intuitive, which listens to our heart. Heart intelligence has been clearly defined by organizations such as Heartmath.org, as capable of knowing all that is for our highest good as well as the good of the collective. 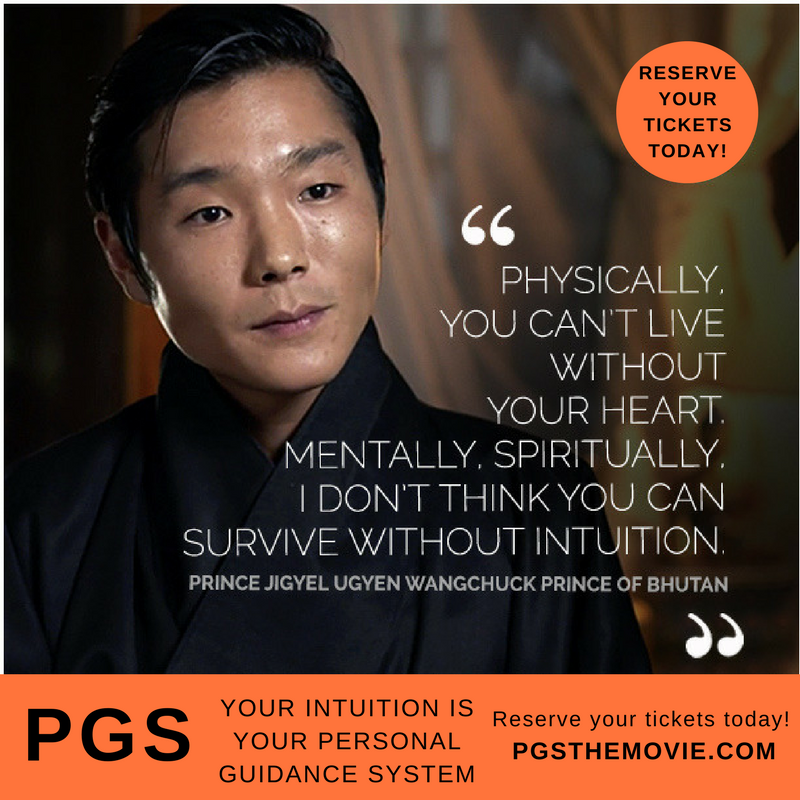 Our ability to find equilibrium in our day to day, is highly dependent on our ability to tap to our heart’s intelligence, together with our gut intelligence and brain intelligence. When we become aware of all three sources of KNOWING, we empower ourselves to harmonize every decision we make with our true core values. The more we know what those core values are, the more we have access to WISDOM. Some call it Higher Self, some call it Essence, some call it God within, but whatever you choose to call it, it is an aspect of ourselves that needs to be nurtured, understood, and trained to speak to us in the language we are able to receive inner guidance. 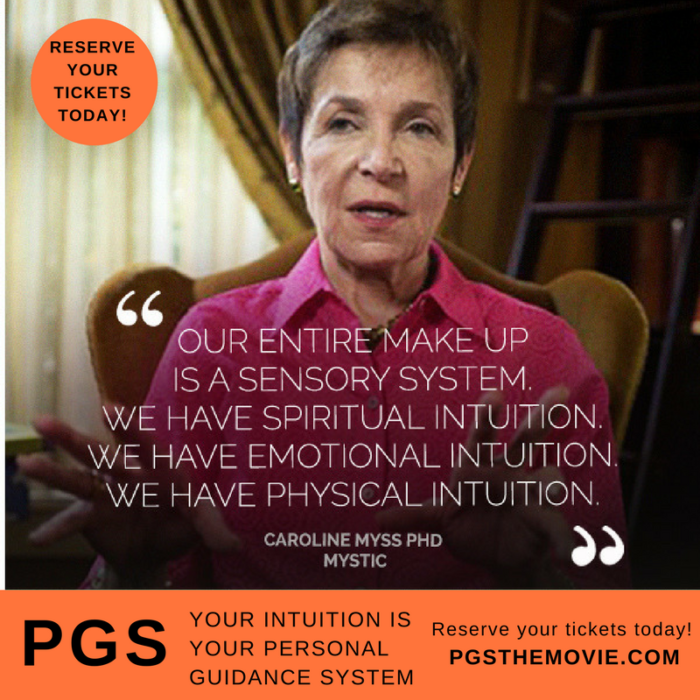 I leave the rest to Bill Bennet at this beautifully shot film to express it’s practical and grounded poetry about the magic that unfolds when we tap to our Personal Guiding System (PGS), Intuition. 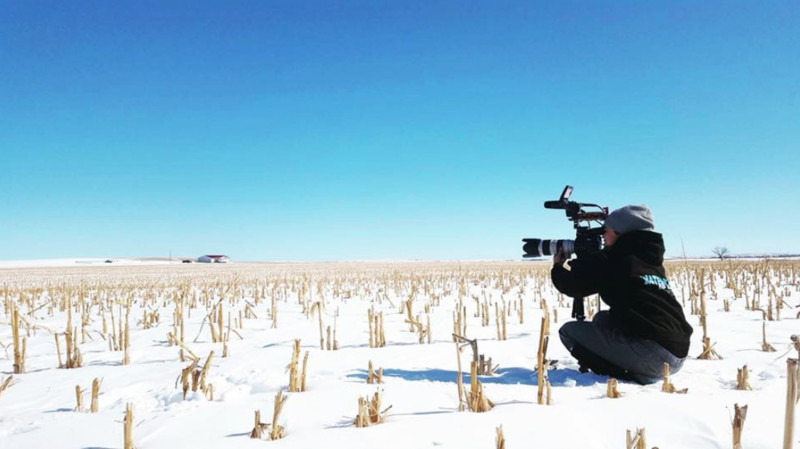 C2E Board Member Kumiko Hayashi served as indigenous liaison and cinematography support for a very special documentary film which intends to share the truth of indigenous women. On the road again…We packed the RV and we were off with two dogs in the back, our camera equipment, and enough food for two months. 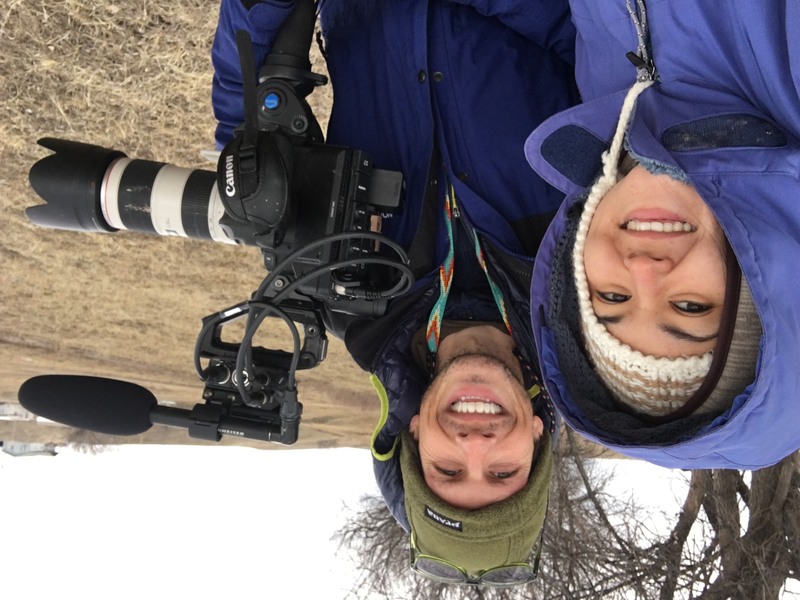 Deborah Anderson, the director of the current feature documentary film C2E is acting as Fiscal Agent, titled Sun Dancers, called me in to be a liaison for herself and the Lakota people of the Native American reservation. We set off to listen to the stories of women who have been abused and whose sisters have gone missing, an epidemic across America. 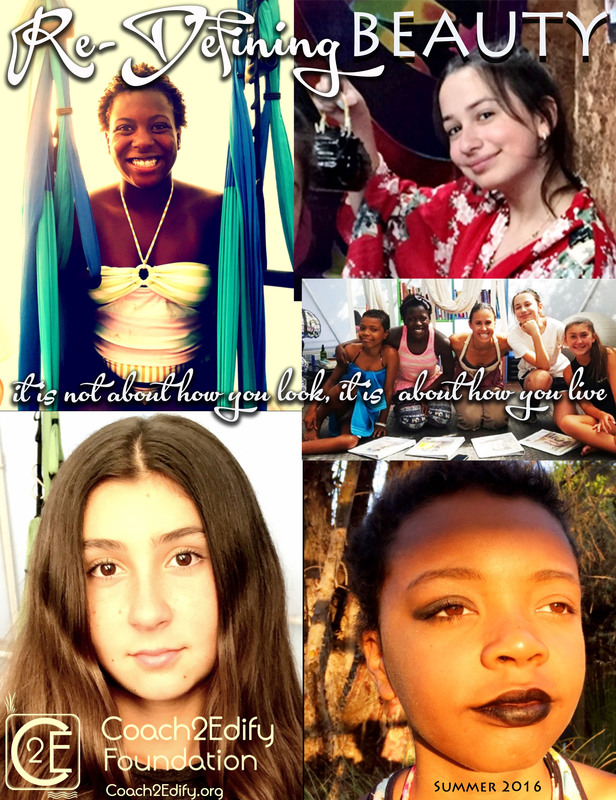 Our mission was to stop the silence and give these women a voice to express the resilience brought about their deep practices of spiritual connection and culture. I was honored to be a bridge for these women. It’s my mission to create value through production and media and provide a platform for underrepresented people. As a board member of C2E I am happy to be a part of this film and bring the values of C2E’s regenerative wellness to the film production realm. You can also e-mail Deborah Anderson directly at creative@deborahanderson.com. 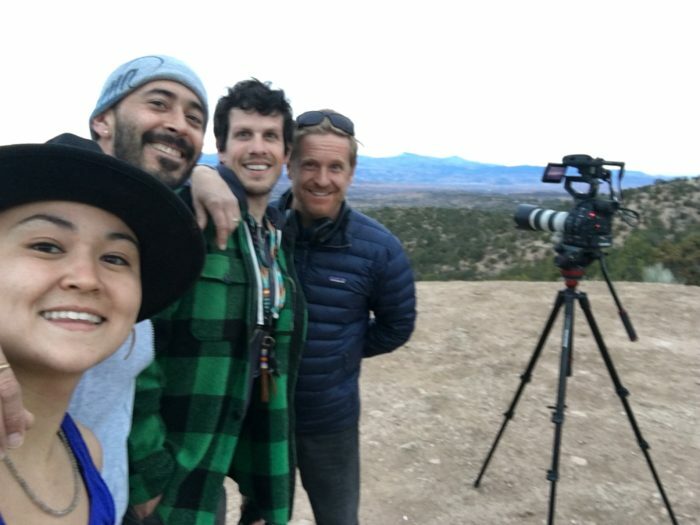 This article concludes C2E’s Summer of Love trilogy of blogs, where we share our experiences of adventures, explorations and service involving our passion for education on the science of regenerative living. 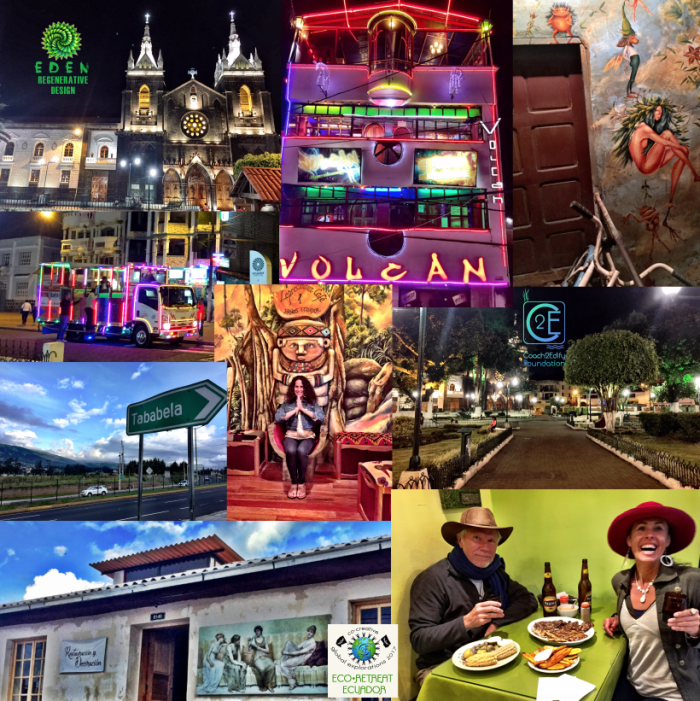 This blog is about our last portion of our travels in Ecuador. As I continued my journey with Tim, my beloved playmate, our trip to the Amazon became an opportunity to celebrate our accomplishment of having completed a perfect retreat (Eco-Retreat: Ecuador BLOG here!). 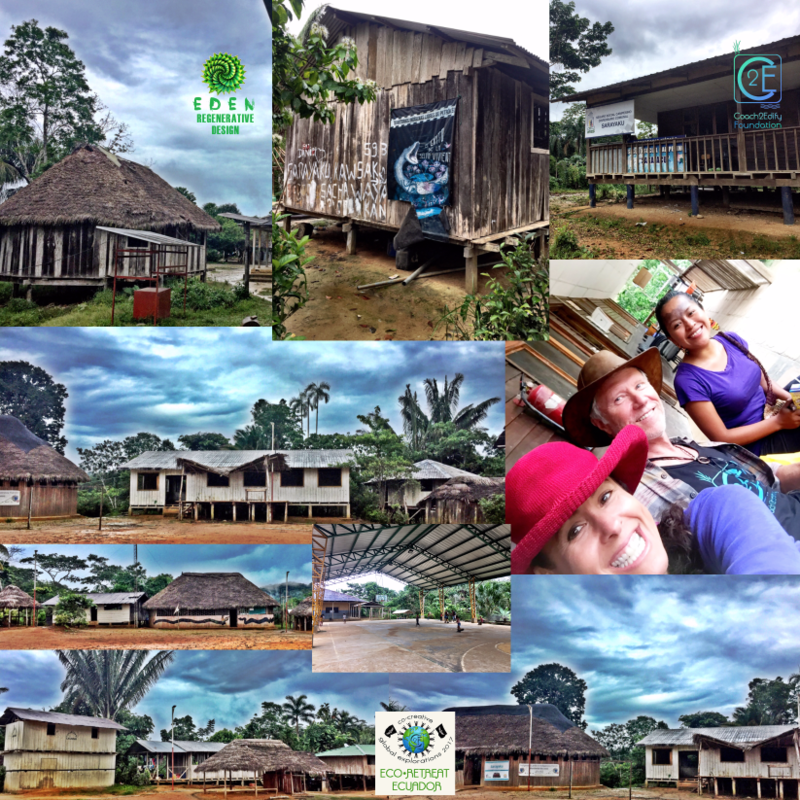 Our intention in this portion of our trip was to explore a community in the Ecuadorian territory of the Amazon, the community of Sarayaku. I was first introduced to Sarayaku 3 years ago while watching the preview for a documentary, The Roots Awaken. Filmed by my dear friend, colleague, and C2E Board Member, Kumiko Hayashi. She is also the founder of SOKAVision. 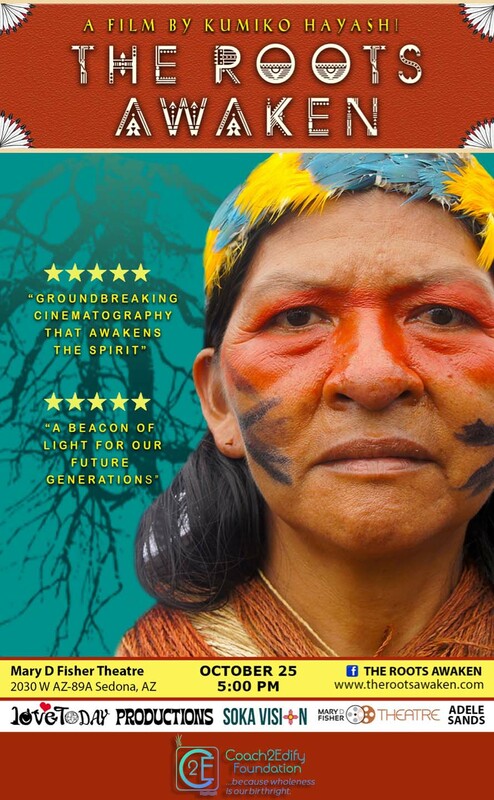 The documentary was produced as a Community Cinema project in various Amazonian Communities. Kumiko’s intention was to create a film where the various communities in the Ecuadorian Amazon could see how they were all ONE and the same, in spite of the strife that becomes activated by oil companies using the old school divide and conquer strategy. I never had Ecuador on my radar for future travel possibilities, however at that moment, there was nothing more I wanted than to BE THERE. 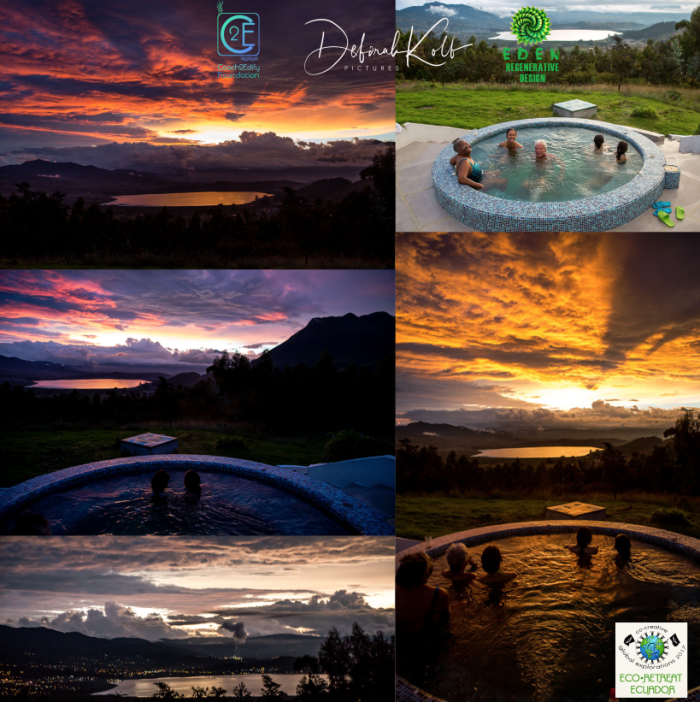 Two weeks later a Puerto Rican soul sister sends me a link telling me I HAVE to check this out, it was the Eco-Lodge Sacha Ji…the rest is history. I had never even imagined going to the Amazon. The thought created a sense of intimidation, as if the Amazon is only for hard-core adventurers. I never considered myself a hard-core adventurer, but Tim is one for sure! 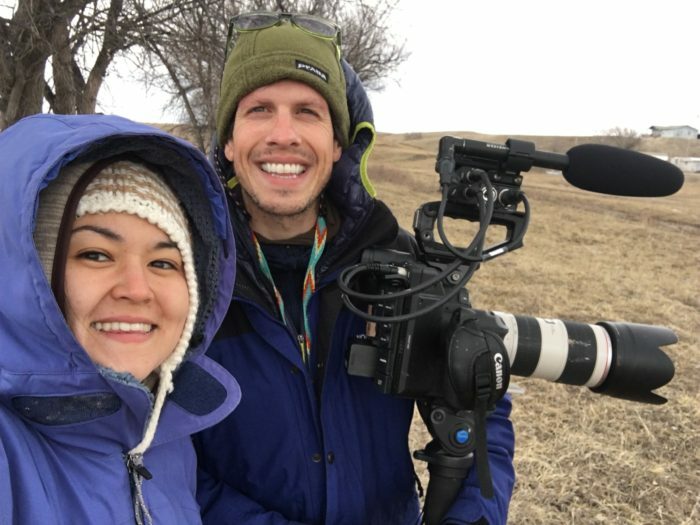 The fact that he was going helped me feel safe and confident as well as the fact that Kumiko made the necessary connections so we could stay with her host family from when she filmed her documentary. Our curiosity about the Kichwa people of Sarayaku, stemmed from our desire to take University students to an Eco-Retreat, where in addition to visiting Sacha Ji Eco-Lodge we would also go to create a more grassroots version of the nature connection lifestyle in order to deepen the cultural exchange experience. We first stopped in Quito, the buzzing capital of Ecuador, for a couple of nights. 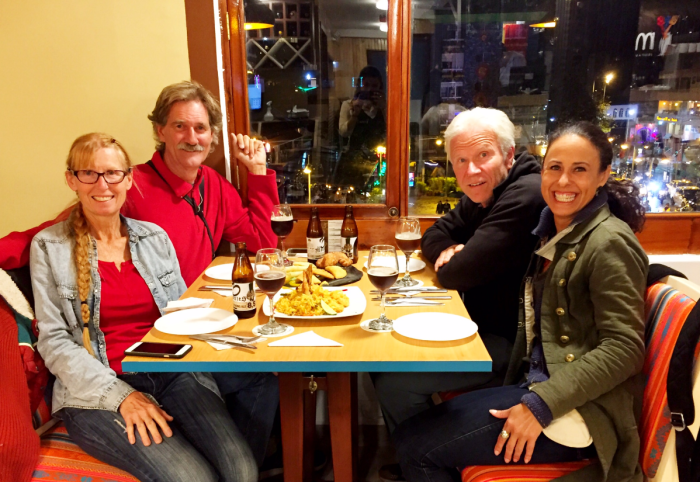 Our first night in Quito was with our happy campers Julia and Buck, Eco-Retreat family who were on their way back to Los Angeles. We celebrated with a wonderful view of the fun town with a great selection of Ecuadorian food samplers. We stayed in a lovely hostel that reminded me of Puerto Rico’s cottage industry, restaurants, and bars, as well as the Eco-Chic AirB&B my residence in Woodland Hills has become. We also visited La Ciudad Antigua (Old Town) filled with majestic Spanish architecture and cobblestones reminiscent of Old San Juan, Puerto Rico and Madrid, Spain. The ornate churches were breathtaking, reminding us of the strong Catholic influence in Ecuador. A very long story short, we will fast forward to the town of Puyo, where finding the boat ride to get us to Sarayaku was quite the adventure. Bottom line: anyone cannot just step in a boat and go IN. But thank God we had the Sarayaku connection in Puyo with the Gualinga family, our hosts in Sarayaku, with Franco and Daniela, brother and sister who currently reside in Puyo. They were true ambassadors, made the arrangements by jumping loops left and right since Sarayaku’s Presidenta, Mirian Cisneros, just elected President a few weeks prior, was IN (Sarayaku) and not available to grant us permission. We lost a night, but the next morning, after about 3 hours of prep and travel time to get to the wooden canoe, we were on our way! Except that the motor’s cord in the canoe breaks as Marco, or captain, was pulling to start it. I thought this was it, we were not going into the Amazon. How where we going to get a mechanic to fix the motor? To my delight and surprise this people can fix anything. Within minutes there was a crew of about 3-4 working and fixing the motor, and they did!! Suddenly, I was there, a surreal moment of walking into a dream, the Amazonian jungle, with the Bobonaza river at a high water level after a lot of rain the night previous, taking the muddy melted earth look. Below is a video of this unforgettable moment. We were received by Shinae and Don Miguel Gualinga, after a very muddy hike on flip flops filled with information on how to pack smarter next time. They received us like Super Hosts, even though they had no idea we were arriving due to some communication breakdowns and rookie moves in my part as I coordinated the plans from LA. It was a humbling experience to have them graciously cook meals for us and provide accommodations. We slept in an open room on stilts with a corrugated metal roof that was my sleep’s lullaby during the rainy nights. Don Miguel and the men of the tribe are in charge of building everything in the community. Each family had a very similar lay out of the family house on stilts with the family’s bedrooms, and a guest stilt house. When we were setting our stuff in our bedroom for the next couple of days, I had one of the most joyful encounters to date in this trip. Little baby brother, saw me from the balcony in his stilt house right across the way and began to play sword ninja with me in a spontaneous ‘take turns being a ninja’ game we played for a while. The children of Sarayaku are healthy, joyful, highly intelligent, and boy super strong! We ended up playing animal flow and he could do ALL the moves. The next day Shinae Gualinga, a true diplomat of her people, took us on a tour of their village and took us to a chicha (their spirit of choice) party with her girlfriends. The village was clean and organized. Each building in the village had a government assigned role, such as the library, congress, assembly, presidenta’s house, and cultural center. They also had a clinic funded by the Ecuadorian government. Shinae introduced us to the village doctor who sat with us for a while and was very open about their victories, challenges and concerns. We also enjoyed seeing the expansive school buildings with lots of happy children playing, in class, and so curious about us. 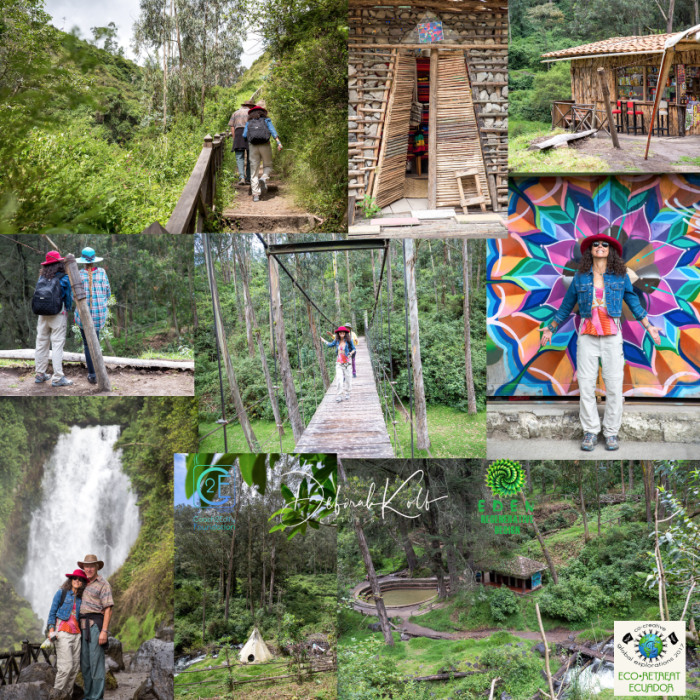 The bridges, rivers, and all the steep climbs that led us to the chicha party were breathtaking and thankfully very doable too (although still tough). I wanted to take in everything with every ounce of my being. Having chicha with the local women was a blast. We sat for hours sipping from the bowls of the fermented drink. Thank God Tim and I are beasts and took the spirits like pros! 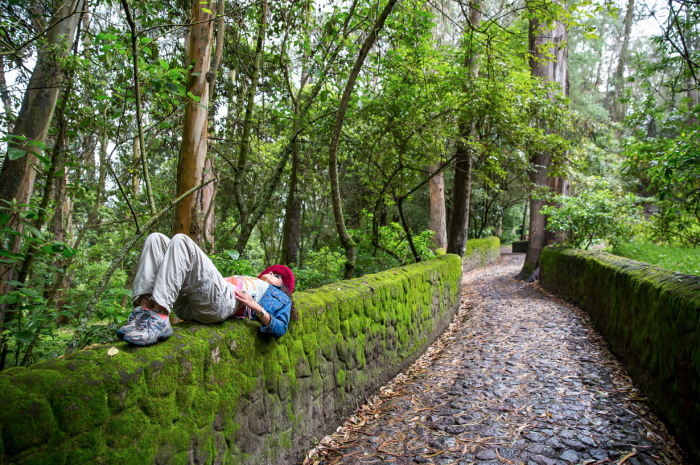 Shinae was certainly impressed with our endurance and kept sharing stories of visitors who didn’t make it out of the chicha party with a sober mind able to walk back. Uff! We were even able to head back and have a great talk with Sarayaku’s Presidenta Miriam Cisneros, who welcomed us, and even invited us to a health forum the following day, which we couldn’t attend due to our very tight traveling schedule, but we did talk about coming back with a group for a cultural exchange program, and she was very open and willing to collaborate! YES!!!! Mission accomplished! On our way back to Quito we stopped at the lovely ecological adventure city of Baños de Agua Santa, with it’s beautiful colonial buildings in contrast to the 3 stories bars/discos filled with the party ambience of Old San Juan meets Madrid. Only difference here was that the town goes to sleep by midnight, which was a good thing! 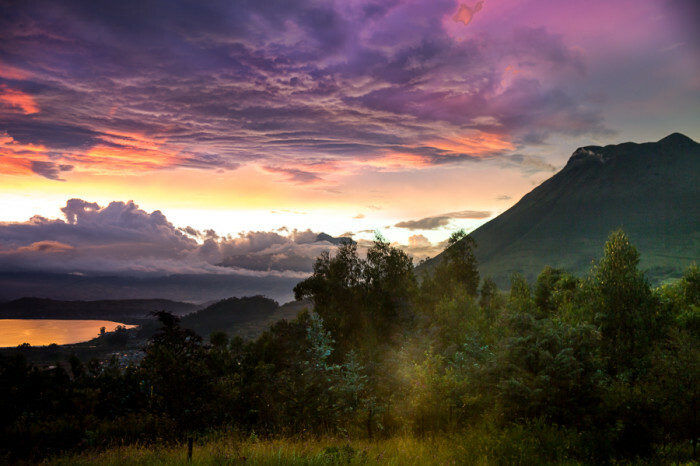 Baños is filled with young travelers from all over the world seeking ecological adventures such as river rafting, rock climbing, mountain biking, cave exploring, hot springs and active volcano trails. 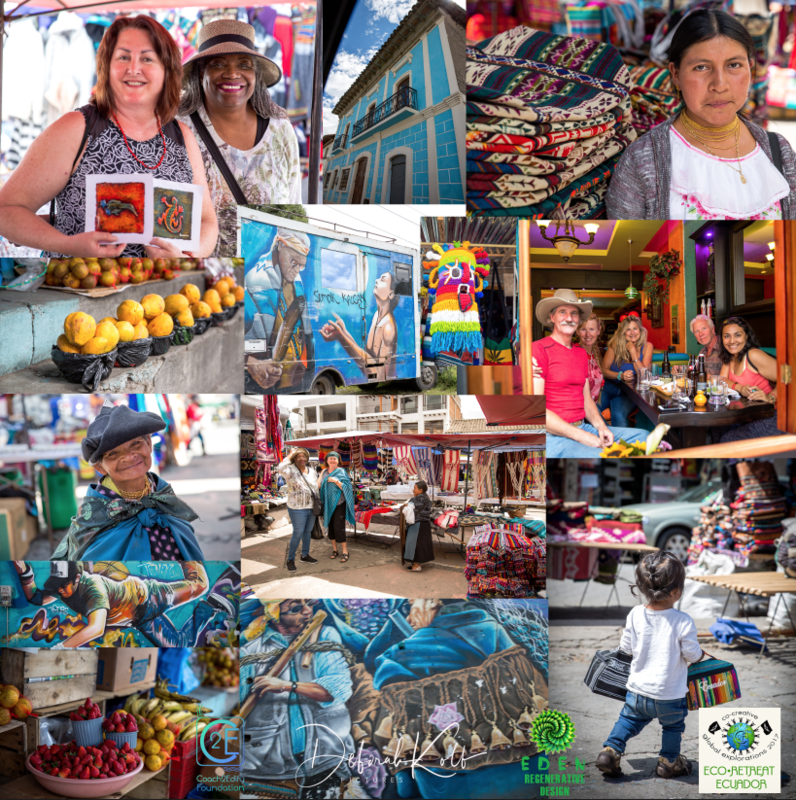 Our research and development portion of this Global Exploration came to a completion in Quito’s airport neighborhood Tababela, which didn’t stop to amaze us with it’s charm, mini farms all titled after family members and heart of service. Our last epic moment in Ecuador was when a gentleman in his 70′s greeted me with a huge smile and hello, asking me what did I harvest today. We had traced the path of another future Global Exploration. We all had a loving and rich experience, claiming to come back again for sure! It is that time to share Coach2Edify’s (C2E) journey this summer. 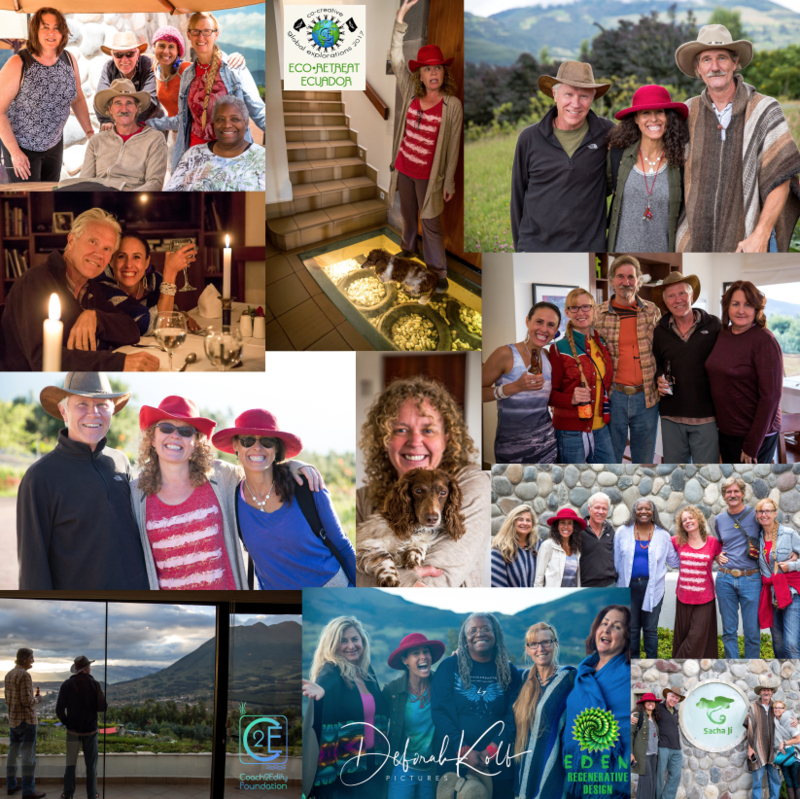 We continue to evolve by collectively exploring the ways of co-creators, activating our gifts to empower others, and, taking full ownership of our health – all united by the passion to share foundations of well-being for ALL. This blog is my personal account of C2E’s 2nd Co-Creative Global Explorations, Eco-Retreat: Ecuador. A virtual program called Inner Explorations preceded C2E’s summer curriculum. This 3-month course took each participant through all 6 pillars of C2E’s Foundations of Well-Being Template. 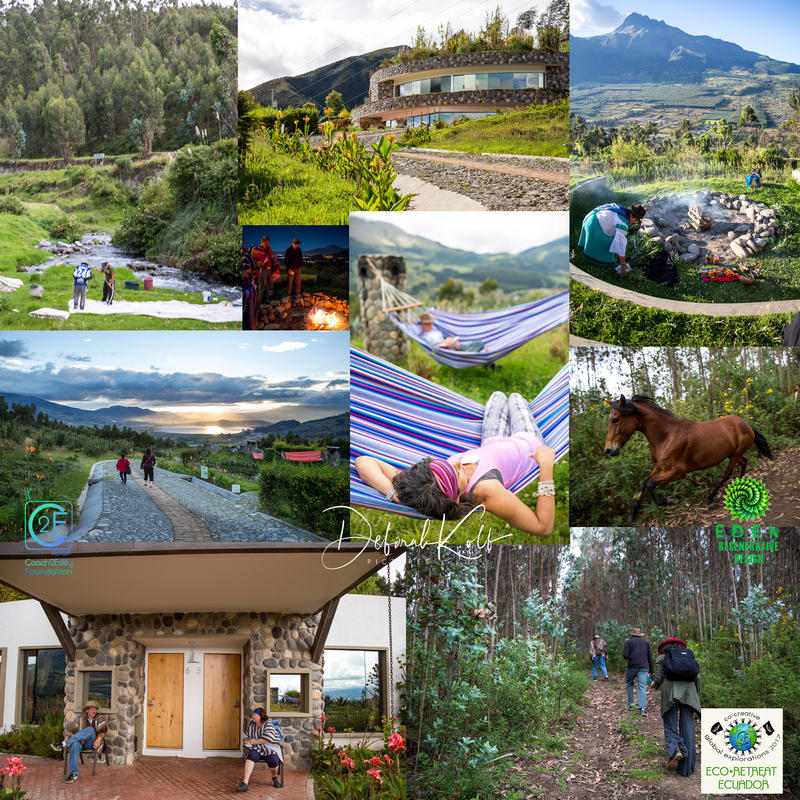 Eco-Retreat: Ecuador marks the graduation for Inner Explorations and was selected for this year’s Global Exploration to continue C2E’s tradition of staying in our equator. The mission of the retreat was to explore our personal equator and how it relates to our external world. We believe that this personal equator’s key component is LOVE and that our healing capacities can be found by knowing how to access and connect with the vibrational frequency of this LOVE. That’s why we felt there is no better way to kick off the 50th Anniversary of the Summer of Love, the social phenomena that took place in 1967, embodying a revolution of liberty and justice for all, and above all peace and love. On a personal note, I am also celebrating my 50th birthday this year and even though I was born in 1967, I feel as if I am part of the movement. The retreat took place the first weekend in June in the Andes plateau of Ecuador, the first week in June, in the province of Imbabura. A community that holds on to their cultural traditions and practice ceremony as their ancestors did. Our home for 6 nights was the Eco-Lodge, Sacha Ji. It was a sanctuary of ecological genius and the most loving heart of service I’ve witnessed to date. Hotel owner and green architect Maria Teresa Ponce was an exceptional host. 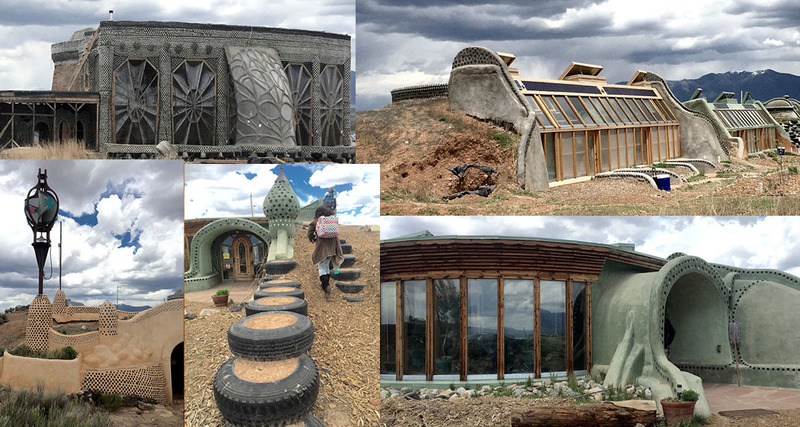 She was eager to share the earthship techniques she used in designing and building this ecological paradise. This retreat’s creative expression is seen all throughout this article with epic photography by Deborah Kolb. The pictures above and below reflect how at ease I felt throughout the whole week. My body felt so light, allergy free, awake, alert, inspired, and feeling extra good. I was so aware of it. Feeling aligned with my center MOST of the time. At times experiencing very euphoric moments while being on the equator of the earth- think of it like alignment on steroids…no, not really…. more like exponential, expansive alignment. The first workshop of the week was on the pillar of Holistic Health, taught by Tim DeLorey, who has taught on Bio-Optimization. 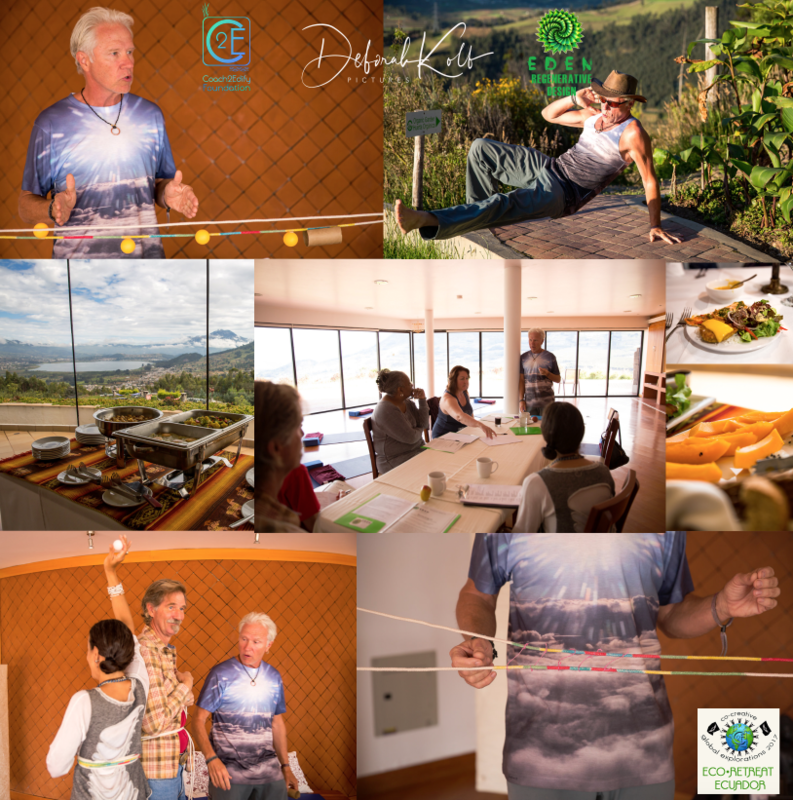 I had witnessed Tim preparing for his workshop months prior, and he delivered a wealth of knowledge that, if applied, will save all of us from many avoidable health concerns in our future. His class was loaded with cutting edge information that was turning everybody’s worlds upside down. 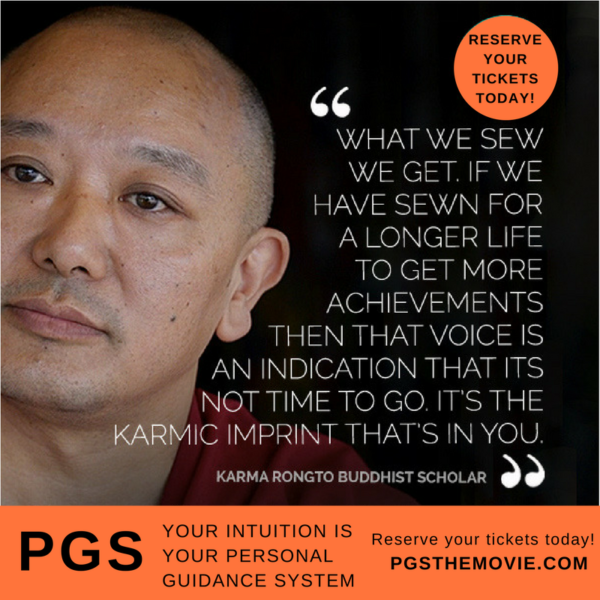 He shared the science of shifting our internal and external environments, with food being a principle component as well as many other elements of our external world, such as computer screens, cell phones, chemical exposure, and toxic relationships. Overcoming our fear of science is a key element to our capacity to take ownership of our health, and he not only made it accessible, but fascinating & entertaining. Day two was my workshop about going deeper into the 6 pillars of well-being. 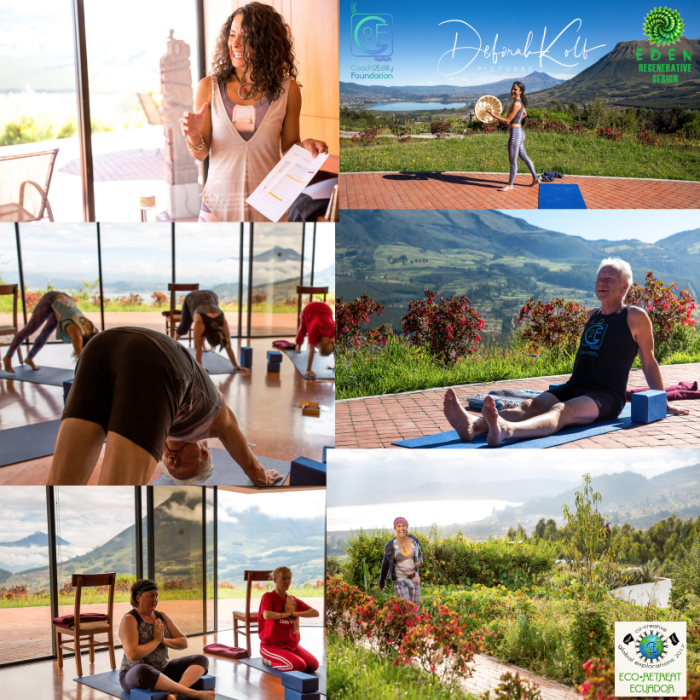 I emphasized on the Body Integration pillar through a daily morning movement and later a meditation class in the yoga studio with panoramic-views through all glass sliding doors. The third day was dedicated to our first field trip on the pillar of Lifestyle Design. As we immersed ourselves in Otovalo Market’s creative fair of excellent craftsmanship- Latin America’s biggest outdoor market is an exquisite demonstration of Ecuadorian passion for color, quality and tradition. We also enjoyed the street art that made of Otovalian downtown a rich gallery of top-notch art. 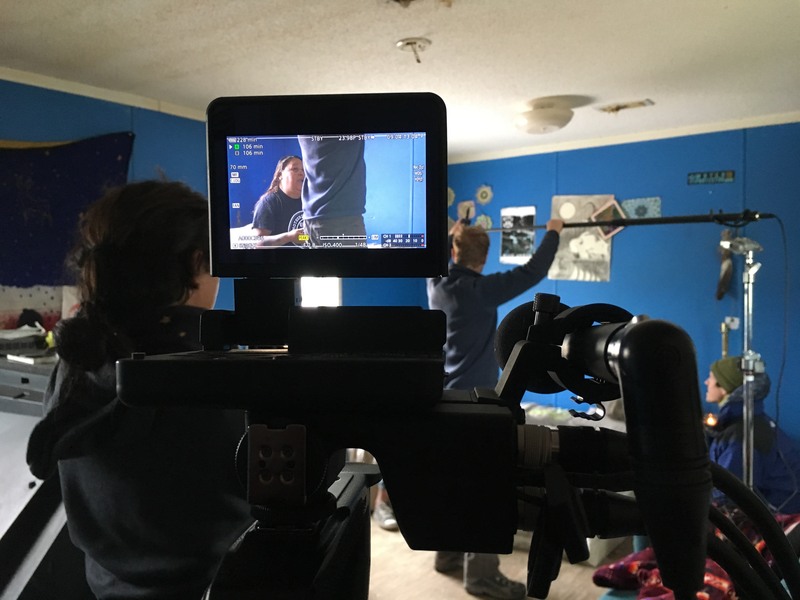 On our last day of the workshop, we did the pillar of Creative Expression with Deborah Kolb for her photography 101 class. We learned so many simple and effective techniques using our cell phone cameras. She taught us about composition, lighting, editing, attending to strangers’ dignity as you photograph them, and how to use the camera to express how you feel about what you’re seeing. The panoramic shot in the collage below was taken right after her class’ inspiration. Deborah not only shared her tricks as an award-winning photographer but also looked after our own pictures and then gifted us with a photo album which matches a wedding album’s quality, very appropriate, since this was kind of a wedding to our commitment to self-care. 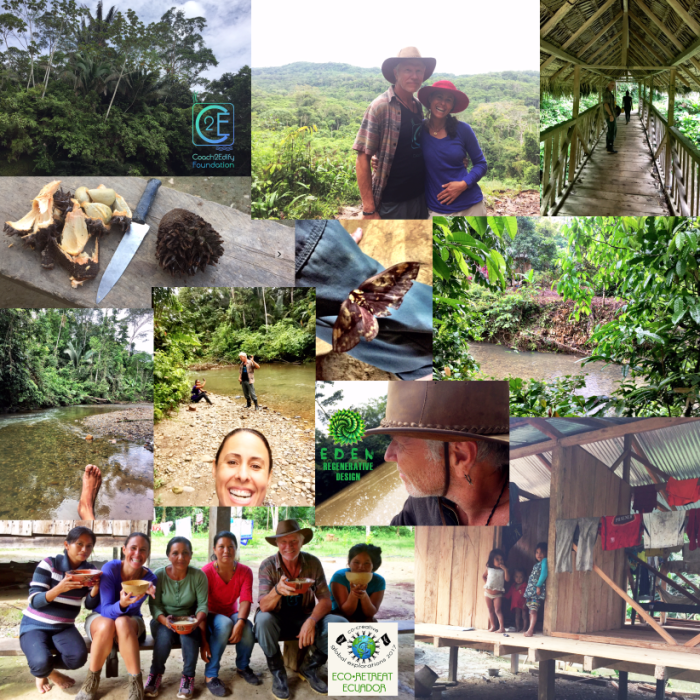 Our last field trip was dedicated to the pillar of Nature Connection, as we visited the town of Peguche. The location of the famous Peguche waterfall. I was so proud of our happy campers who took on a very strenuous hike like pros, even when some had never been on a hike before. The waterfall had a quaint village enjoyed by many locals who bring their children to enjoy nature’s best. I loved that we had time to enjoy Sacha Ji’s grounds. 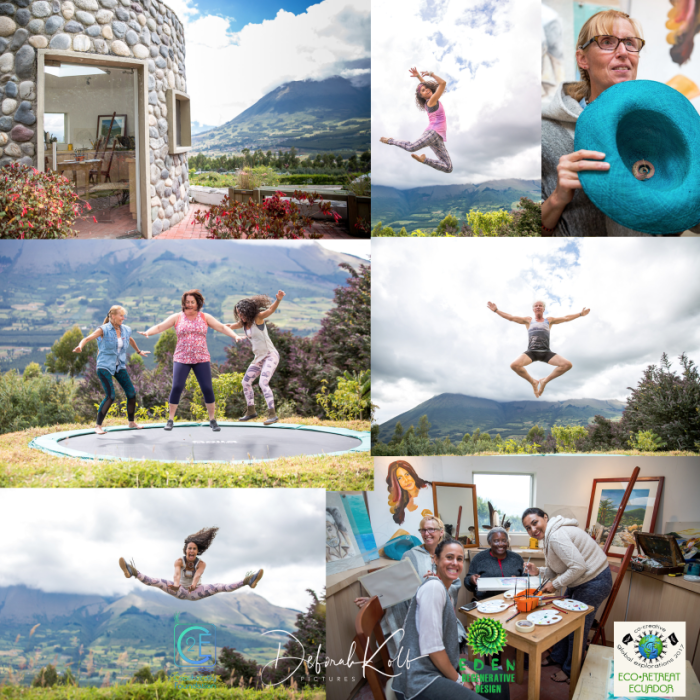 Garden roofs with hammocks, breathtaking views, the constant elegant presence of the volcanoes, Mama y Papa Imbabura, which had uncanny profiles, community building fire pit, and an extended golden hour due to the equatorial location! We took hikes without having to drive anywhere and even saw wild horses stomping our hiking trail. We even had time to play and do an impromptu art class in the most-quaint art studio I had ever seen. We all took a class with Sacha Ji’s awesome Belén, manager and art teacher. She taught us about watercolor and how to ‘let it go.’ Our lovely Julia found a spiraled eucalyptus tree leaf, which infused tons of inspiration. God knows how much I love playing and jumping on the trampoline. We all graduated from the final frontier, the pillar of Community Building, with flying colors. Even though all who came didn’t know each other, prior to the trip, we truly felt like a loving, joyful, playful, and authentically curious troopers. We became a family of happy campers! Our times in the hot jacuzzi were our reward and gift daily. We were actively applying one of Tim’s class biohacks “cold thermogenesis” since there was a cold plunge pool right next to the hot tub. The sunsets were pure medicine and the photography Deborah captured pure magic. As almost everyone in attendances expressed an strong interest in returning to next year we are most likely to take a group with us in 2018 again, so please feel free to e-mail me: mayra@coach2edify.org to start your pre-registration process. 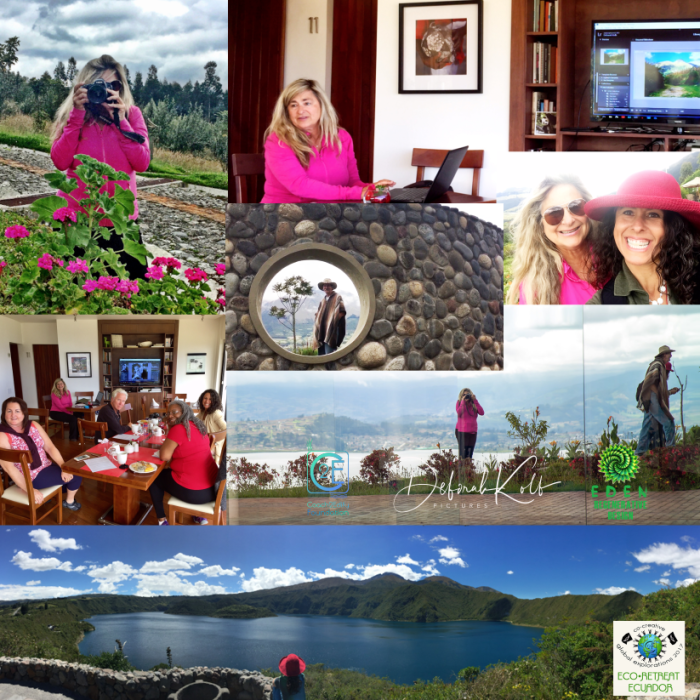 Stay tuned for my next blog, featuring Tim & I’s continued explorations in Quito and the Amazon! 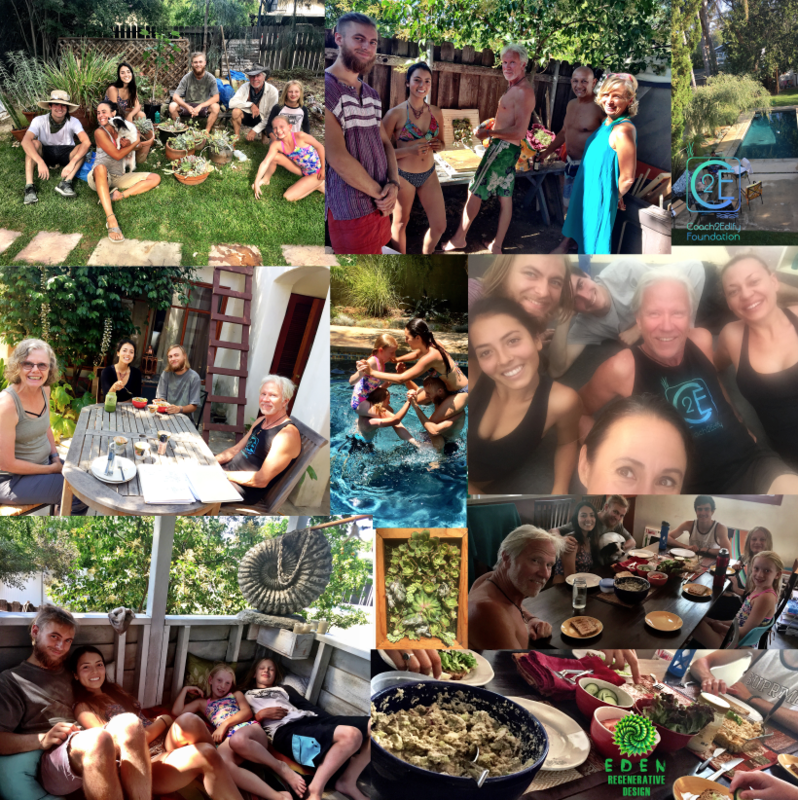 This is Part 2 of C2E’s Summer Experiences this year, which happened to land on the 50th Anniversary of the Summer of Love, a perfect theme to play with in exploring lifestyles that were re-birthed during the historical summer of 1967. We believe in being where the East meets the West, on finding that line that sits between both worlds, merging corporate genius with ancient wisdom to give birth to the brave new world that seems to want to be born these days. Below you will find our experience with playing with these concepts. This summer’s program in C2E’s Villa was inspired by a lifestyle we have found to be the most aligned with C2E’s Mission. 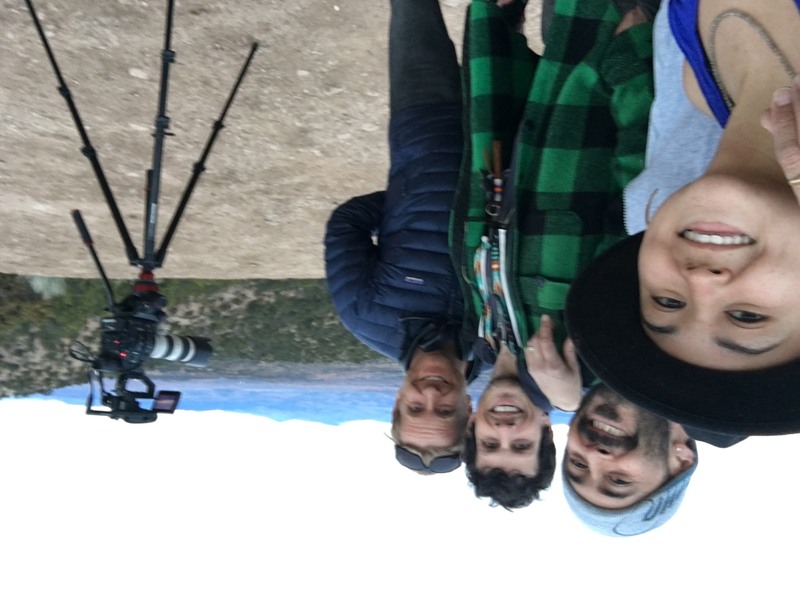 We have been researching and visiting intentional communities in Arizona, New Mexico, Oregon and California, learning about this alternative way of living that intends to bring us to an intimate relationship with nature. 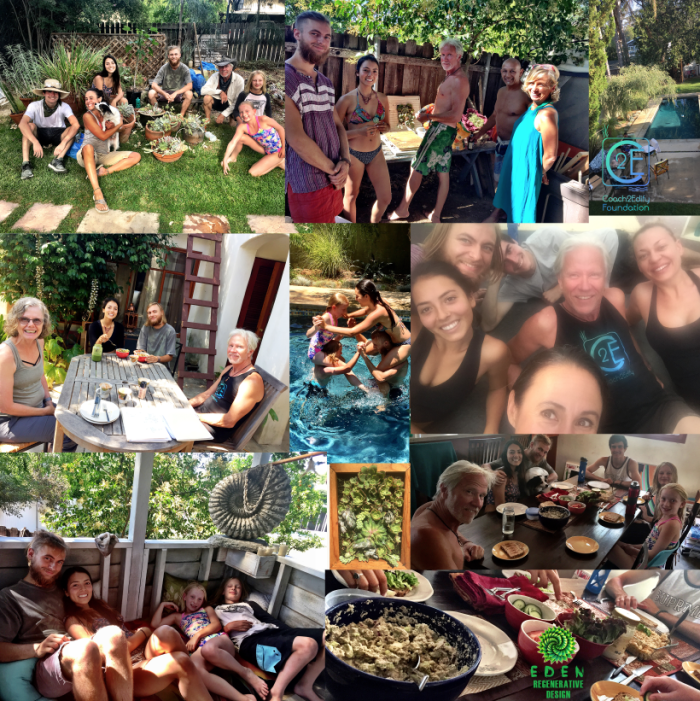 Our intention was to activate all we learned to date about this kind of lifestyle, which has a huge community-building component. We did this by designing a program that resembled Eco-Village’s day to day activities and intentions, dedicated to the science of regenerative living and whose goal is to become more socially, economically and ecologically sustainable. This became a wonderful opportunity to have a tangible experience with this kind of lifestyle for longer than a weekend or two. 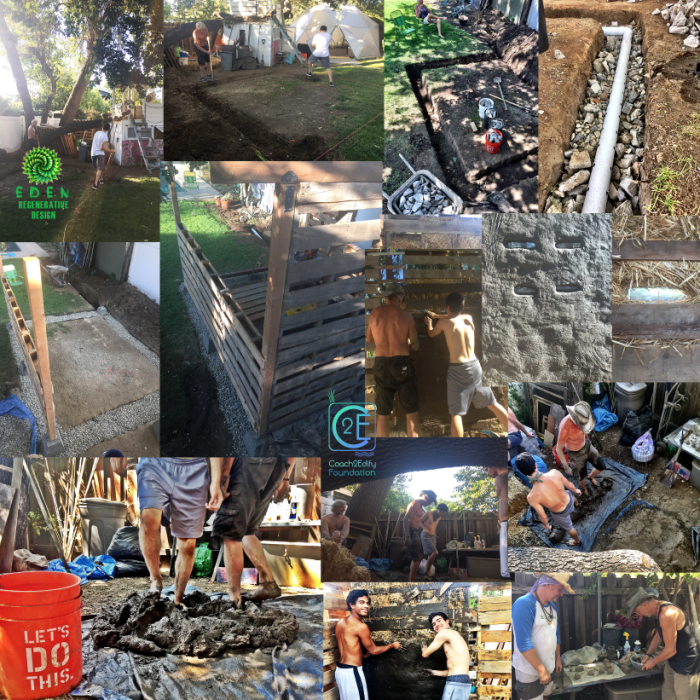 Lead by Eden Regenerative Design’s Tim DeLorey, PhD, we immersed ourselves in a full month of interns, community building, earth building, compost production, super foods & vegan menus, succulent framed gardens, and lots of fun. 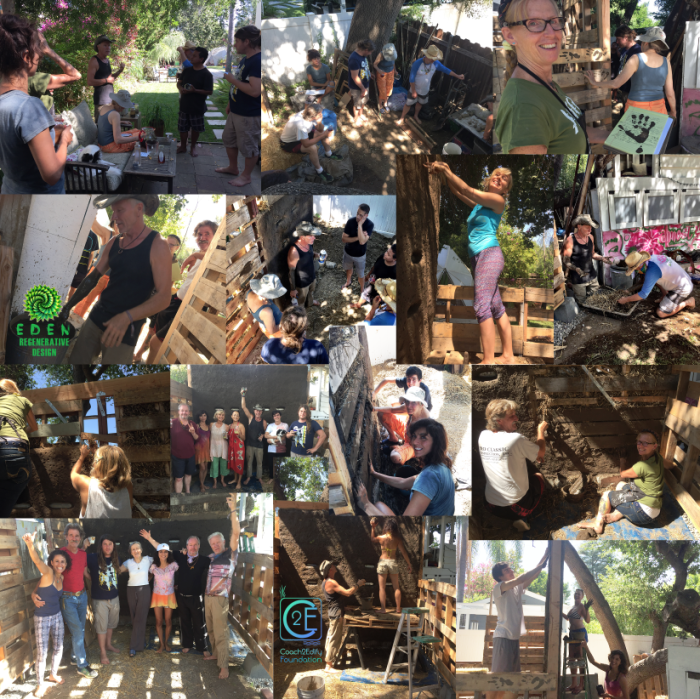 Our main project focus during our summer program was the building of a Cob-pallett Cottage in C2E’s Villa backyard, right next to the Geodesic Dome. This structure is C2E’s Villa 3rd sustainable architecture detached room on the property (an RV being the 2nd, and Dome 1st). We believe that part of nature connection is to create spaces that will help you stay closer with the great outdoors. We also believe that a key part of a regenerative lifestyle design is creating ways to build shelter that are economical, use recycled materials and build community, which is super fun. The program’s last weekend was a Workshop taught by Tim DeLorey on the technique for building this type of structure for less than $600. We had a fantastic group of community earth builders join us for a weekend filled with regenerative lifestyle pathways such as body integration, healthy vegetarian meals, super foods snacks, and playful times of cob dancing. Community building is one of the most challenging but fulfilling aspects of sharing space with a group of people. Having co-creative agreements in place and being quick to address issues as they come up really helps keep the environment free of strife and full with love, harmony, and peace. We enjoyed the visit of a diverse group of C2E family dropping by, spending the day, sharing meals, sleeping over, and playing summer camp with a cross-generational group. Thanks to our Board Member Leia Marasovich, we visited a heavenly orchard in Malibu created by June Louks, author of A Malibu Mom’s Manifesto on Fresh, Whole Foods. She was so kind and generous, giving us ALL copies of her book. We ended up using 3 of her recipes during the summer program and they were a delightful and delicious way to explore new recipes with the super foods we love. 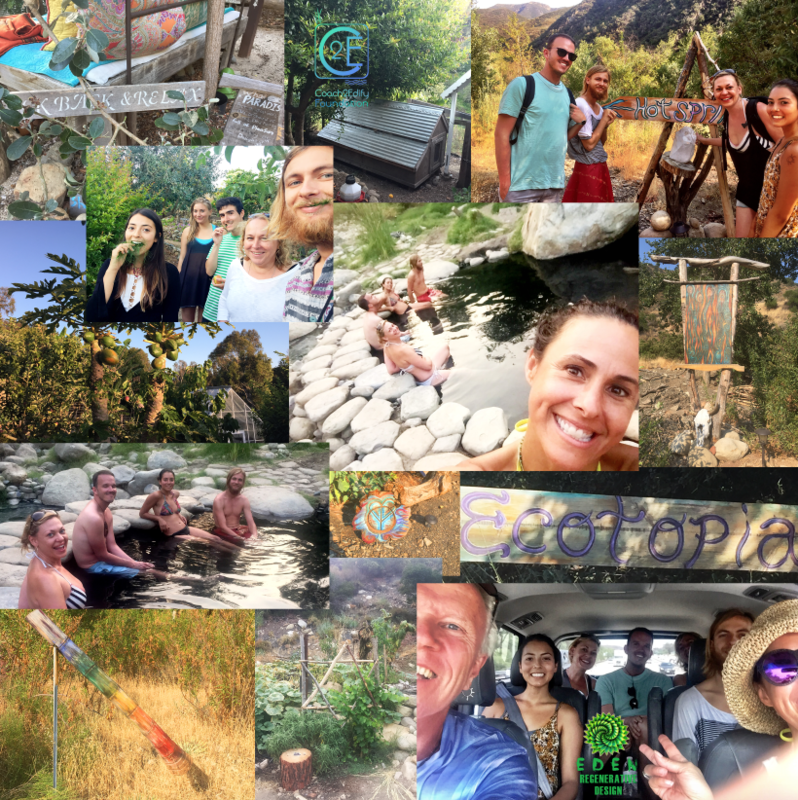 We also visited Ecotopia’s hot springs in Ojai, where our dear friend Robert Redecker, founder of Earthworks Natural Building, gave us a tour of this gorgeous land dedicated to offer a natural setting to restore, learn and connect. The hot springs were right next to a beautiful river where we can do the hot/cold plunges which are amongst our favorite biohacks. 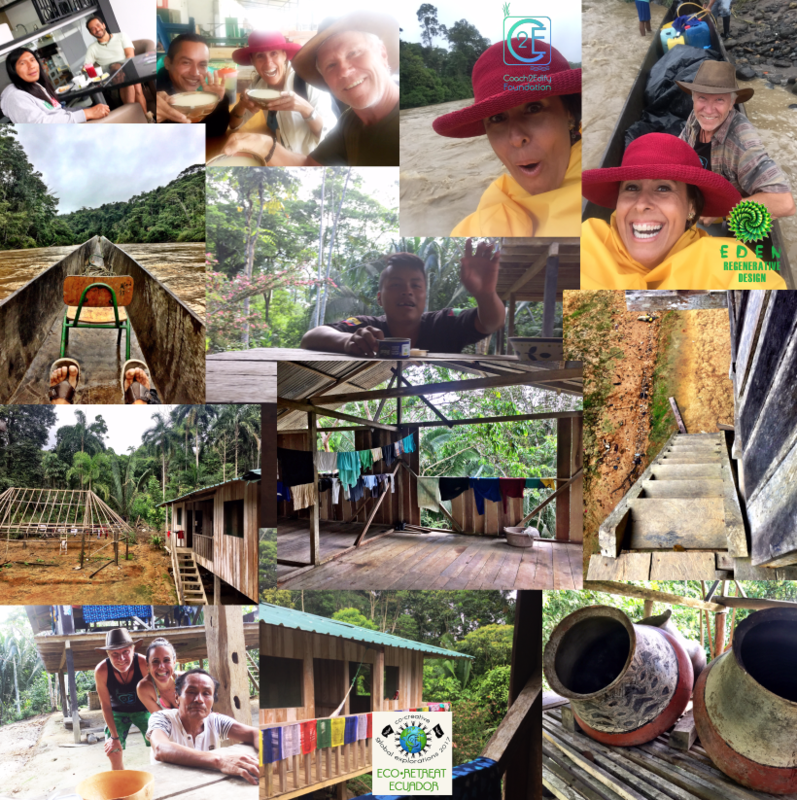 Our Summer of Love at C2E concluded here as we celebrated the first project done as a collaboration with our new Board of Directors, which began our integration process with this Eco-Village experience.